Since 2009 MCSI professors, graduate students and undergraduate students have participated as facilitators and presenters for the ALCOSAN Summer Science program. The program offers students in grades 4-8 an exciting week of hands-on activities and field trips related to the sciences of wastewater treatment and engineering. Each session is designed using Pennsylvania standards for Environment & Ecology as well as Science & Technology and Engineering Education. On Thursday, November 10, 2011, the Mascaro Center for Sustainable Innovation (MCSI) at the University of Academy of Science and Technology at the Phipps Conservatory in Oakland. Carmalt is a Pittsburgh public K-8 school that integrates science and technology across the curriculum. The 8th graders are competing in the Future City Competition sponsored by the National Engineers Week Foundation. The competition tasks student teams with designing a city of the future and introduces middle school students to such concepts as engineering, design, city planning, and sustainability. The Carmalt team is currently mentored by MCSI doctoral student and IGERT Fellow Michael Richard. 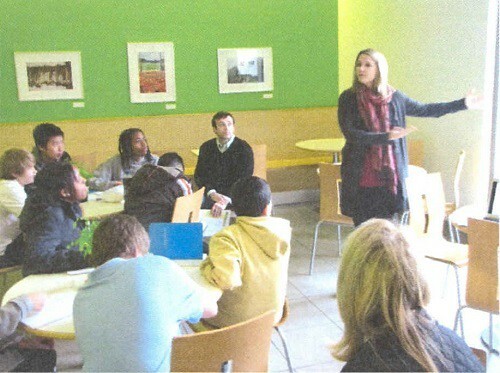 The Carmalt students came to the Phipps Conservatory to learn about the concepts of sustainability and green buildings. Phipps Conservatory is recognized as one of America's greenest public gardens and strives to promote sustainability in all aspects of its operation. It therefore provided an excellent venue for teaching sustainability. The gth graders were given a green building tour of the conservatory by Dr. Melissa Bilec of MCSI. Graduate students from MCSI and the School of Engineering then led students in discussions and activities about energy production and the roles of various engineering disciplines. Collaborating with the Carnegie Science Center, Conservation Consultants Inc., and Bayer MaterialScience, the Mascaro Center spearheaded the Building Green exhibit at the Carnegie Science Center. This exhibit, which opened in November 2007, features green alternatives and options for flooring, lighting, wall coverings, insulation, etc. The goal is to provide young people with an interactive, hands-on opportunity to learn about green design and its impact on human health and the environment. The Ceramic Filter Project is a multidisciplinary group at the University of Pittsburgh that works with community organizations in the Pittsburgh area on the development and implementation of low-cost ceramic water filters through service learning experiences and research. The activities of the Ceramic Filter Project are supervised and coordinated by Dr. Ian Nettleship in the University of Pittsburgh's Department of Mechanical Engineering and Materials Science. Dr. Nettleship works with student organizations (Engineers Without Borders, Engineers for a Sustainable World, etc.) and other faculty to recruit students into the project and develop documented "hands-on" service based learning experiences for student participants. Dr. Nettleship also works with other faculty on curriculum development and research programs related to the activities of the Ceramic Filter Project. Safe drinking water is essential to health, survival, growth, and development. Over 884 million people worldwide do not currently have access to clean drinking water. The World Health Organization says that millions of people die each year from diarrhea because they don't have access to clean water. Clay-based ceramic water filters are among a few technologies that are recognized to be promising and accessible technologies by the World Health Organization because they have been shown to be very effective at removing bacteria from drinking water. It is also a sustainable approach because all societies have a functioning ceramics manufacturing industry that has traditionally supplied containers for household water storage. Ian Nettleship heads a team of engineers studying the distribution of silver through ceramic water filters . The metal tends to flake off the surface of the filter, so Nettleship's team seeks a longer lasting solution. The tiny, nondescript domes dripping water into Home Depot buckets don't look like much in the name of saving lives or cutting edge research, but Nettleship points out that the filters remove contaminants from drinking water, with the potential to save thousands of lives. His team collaborates with Potters for Peace, and a group of ceramic artists who have been developing the filters in a pottery studio in Braddock, Pa., a former steel town adjacent to Pittsburgh. Nettleship and his students study the ways the metal needs to cooperate with the clay; Potters for Peace work on distributing the filters and disseminating information about their use. Over the past two years, MCSI faculty have worked with South Park Middle School and Shaler School District providing green building tours of Phipps Conservatory and hands-on learning projects for students aimed at teaching them how green building and sustainability impact their lives and the communities in which we live. Thank you for taking the time to meet with us, your generous hospitality during our visit to Phipps Conservatory was very much appreciated. Throughout the field trip you continuously mentioned sustainability, a concept I admit I had never thought about. This opened my eyes to the fact that sustainability turns the concept of, “going green” into something else entirely. Currently our country is all about change, perhaps if more people were educated about the concept of sustainability it could be employed in many more aspects of our daily life for the better. I hope to learn even more about this concept from you. Once again, thank you for taking the time out of your busy schedule to meet with us. Thank you so much for the amazing presentation, tour and lunch. It was interesting to learn about the effects of a green building on its community. It was greatly enjoyed and I await to hear from you again. The Mascaro Center’s associated faculty and graduate students have served as mentors for the past six years of the National Engineers’ Week Future City Competition. The goal of the competition is to provide a fun and exciting educational engineering program for seventh- and eighth-grade students that combines a stimulating engineering challenge with a "hands-on" application to present their visions of a city of the future. The competition seeks to educate students in the areas of science, technology, and engineering as they design the cities of tomorrow. During the fall, students complete a computer city model as well as a research essay. The students then create a physical model of their future city to present at the regional competition. Organized locally by the Carnegie Science Center and the Engineers' Society of Western PA, the first place school at the regional level travels to Washington DC to compete in the national round during National Engineers' Week. Special awards are also given for excellence in various topics by local engineering and professional societies. 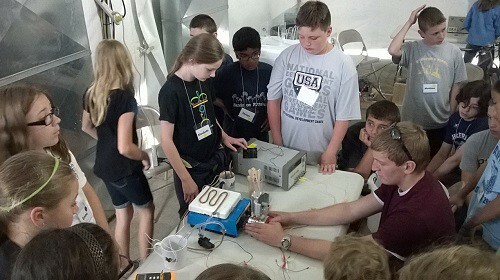 Pittsburgh Carmalt, a Pittsburgh Public School, has participated in the regional competition for the sixth year under the direction of Science teacher Mrs. Lorie Ulmer. In 2013, the Pittsburgh Carmalt team was mentored by MCSI graduate student Michael Richard and won two special awards. Manchester Academic Charter School’s 6th, 7th and 8th grade students also utilized their knowledge of sustainability and engineering to participate in their first National Engineers’ Week Future City competition. Through mentorship of MACS Social Studies teacher Dennis Henderson, Engineering mentor Casey Wagner and visiting assistant professor, Bhavna Sharma, the students successful competed in the competition and won three special awards. MCSI partnered with Urban Youth Action (UYA) to present a series of green lectures to provide 9th, 10th, 11th, and 12th grade students a general understanding of sustainability principles. The lectures, on sustainability, green buildings, energy and water, worked to engage students through presentations and activities. UYA was founded in 1966 and continues to serve young people today in preparing them for the opportunities available in education, employment, entrepreneurship and public service. UYA remains committed to providing youth with the opportunity to become "work ready, life prepared and community minded". The MCSI and UYA partnership was an ideal way to teach young people about the concepts of sustainability and the relationship to their community and everyday life. The Mascaro Center is working with the citizens of Vandergrift (Westmoreland County, Pa.; population: 5,200) to help them become more sustainable while also thriving economically. A group of local citizens (the Vandergrift Improvement Project) has decided to try to grow the town using principles of sustainability (modeled after the Swedish Natural Step program). The Mascaro Center is working to help them to achieve these goals. Beginning in 2005 under the direction of Dr. Mary Besterfield-Sacre, teams of students worked to determine how one might reduce the energy load of the historic Casino Theatre while maintaining its unique character. A second team, led by Dr. Lisa Weiland, continues to examine how micro hydro technologies might enable the Vandergrift business district to lower its energy bills, helping to attract new businesses to town. Results have shown that the Kiskiminetas River is a significant untapped natural energy resource for the town. There also was a knowledge gap, says Weiland, about how best to harness that resource. Weiland recognized that the situation presented a rare opportunity to close that gap by developing new sustainable-energy technology, which would likely have applications far beyond Vandergrift. So she organized a student team—known as the Hydrokinetic Energy Harvesting Team—to work on a new technology. With Weiland’s guidance and seed funding from the Mascaro Center and the Heinz Endowments, the students are now working with Vandergrift residents to harness the Kiski River’s energy in innovative ways while also reducing the town’s energy consumption.